The first club for Mexican college students in the United States? The banner for this website is a detail taken from the image below, showing the Mexican Club at Lincoln Memorial University in 1921. I found it using Ancestry.com’s collection of digitized yearbooks. I’ve been using yearbooks in my work for several months, but this image really surprised me. Lincoln Memorial University Yearbook, 1921, p. 193. I should say that I didn’t exactly stumble upon this yearbook. Earlier this year, I consulted a directory of all the foreign students in the United States, published in 1919, which listed nine students from Mexico attending LMU. Some of them were still there a few years later, so when I searched their names on Ancestry, I found the image of the Mexican Club they belonged to in 1921. 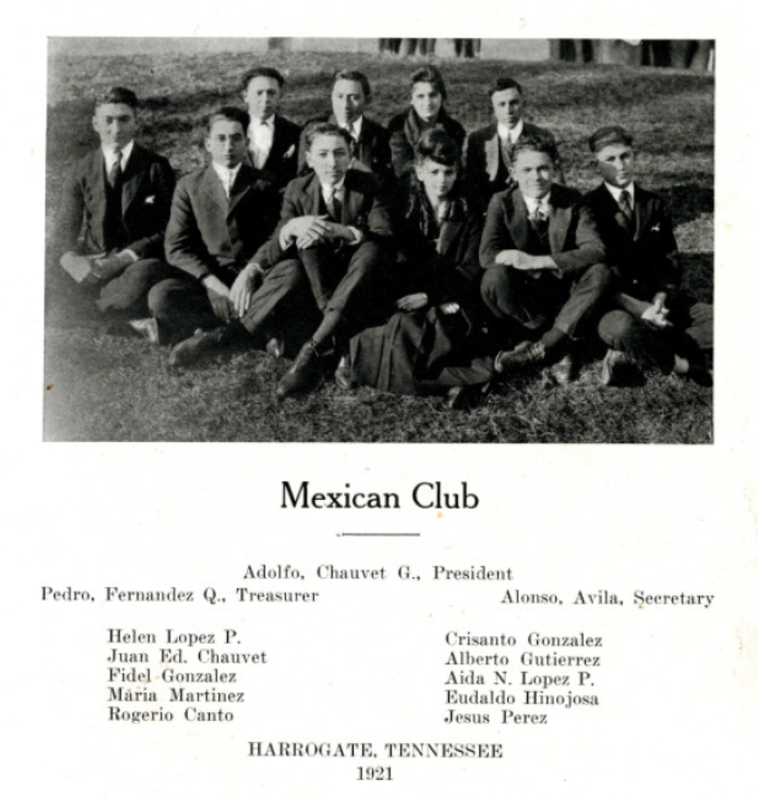 But there is something remarkable about this image: it’s the earliest evidence I have found for a club specifically for Mexican students at a U.S. university. When we think of the earliest waves of Mexican migration to the United States, we don’t usually think of Tennessee. But that’s where this club was founded, at a small university in in the town of Harrogate near the Cumberland Gap. Who were these students, and how did they get to Tennessee? On this blog, I’ll be writing about my search for information to answer these questions about Mexican students in Tennessee and elsewhere.